It's All In Your Head: Be Happy! Looking for lasting happiness outside yourself is meaningless. It is like expecting to become fit by watching other people exercise. How many times have you told yourself "I will be happy as soon as I get..." or "Life will be better once I can..." It's common to think we will be happier or our life will change for the better once something outside of us happens. The happiness that we get from "events" or "things" is fleeting at best. Our spirits are momentarily lifted but soon come crashing down once the glow wears off. 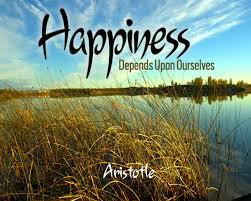 But happiness that comes from inside us...that's a different story. Lasting happiness comes from the heart...and that glow lights us forever.